Last September, the Holyoke City Council unanimously voted to hand ownership of the Victory Theater over to the not-for-profit Massachusetts International Festival of the Arts (MIFA), a group that hopes to reopen the building, which has stood derelict since 1979. MIFA has in hand more than half the estimated $27 million it will take to revive the theater. It’s working closely with Nessen Associates and the Architectural Heritage Foundation on marketing and acquiring the necessary tax incentives and grants. With those resources, MIFA hopes to complete the extensive renovations required and open the curtains again on December 30, 2012. Holyoke once had seven theaters, including a 3,000-seat circular opera house that predated the old Metropolitan in New York City. Many of the greatest opera singers of the day said it was the finest such theater in America. It survived until the early 1960s. Still standing is the Victory Theater on the corner of Suffolk and Chestnut streets, built by the Goldstein Brothers Amusement Company in 1920. The brothers, Nathan and Samuel, were responsible for many of the largest and most magnificent theaters in Western Massachusetts, including the Calvin in Northampton, the Garden in Greenfield, the Paramount in Springfield, the Mohawk in North Adams, the Casino in Ware, and the Colonial in Pittsfield, to name a few. The Victory, though, was considered the flagship of the company. The business had begun elsewhere in Holyoke, but after building across the Valley, they wanted the best for their home city. Much of the painted detailing throughout the theater is Art Deco in style—especially magnificent is the ceiling of an oval room beneath the balcony—but there are flashes of a classical aesthetic at work, too. The curved wall behind the ivory drinking fountain has touches of the original 24-carat gold gilding, and gold detail in the robust proscenium frames the entire stage. The Victory was opened originally for theatrical productions and concerts (a projection booth was added a few years later). In addition to the immense Art Deco theater, the building included a floor of shops on the street level, office space on the second floor, which had housed a music school, and, on the third floor, a series of small efficiency apartments for the casts and crews of traveling productions. “It is the last theater of its kind between Boston and Albany and down to the Shubert,” Donald Sanders, MIFA’s executive artistic director, said in a recent interview with the Advocate. When asked the inevitable question about why the group would attempt such an undertaking in a city that many see as teetering on ruin, Sanders and Kathy McKean, MIFA’s managing director, smiled, ready. Throughout the interview, preserving the theater as a community resource was a regular theme. “1938 was the last class to hold the ceremony here,” McKean said. She hopes that, when the theater reopens, that might happen again. A gallery of images is available at the top of the page, and can be accessed by clicking on the thumbnails below the main illustration. Be certain to click on the left or right side of the images to navigate through all 13 images. A panoramic tour of the theater is available here. Got your own Victory photos? 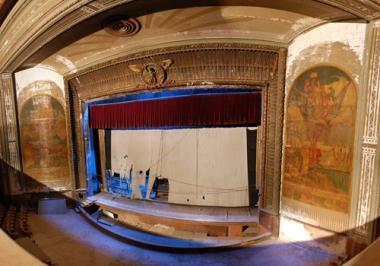 MIFA is eagerly looking for copies of any and all images of the historic theater for renovation purposes. They are particularly interested in images from 1920 to 1942. Please call 413-540-0200.